With employees today having a bigger focus on Learning and Development, there needs to be a more exciting way to address their needs. By using true-to-life experiences, immersive learning online can provide new knowledge as well as putting users through an exciting learning journey, a powerful tool to improve engagement. 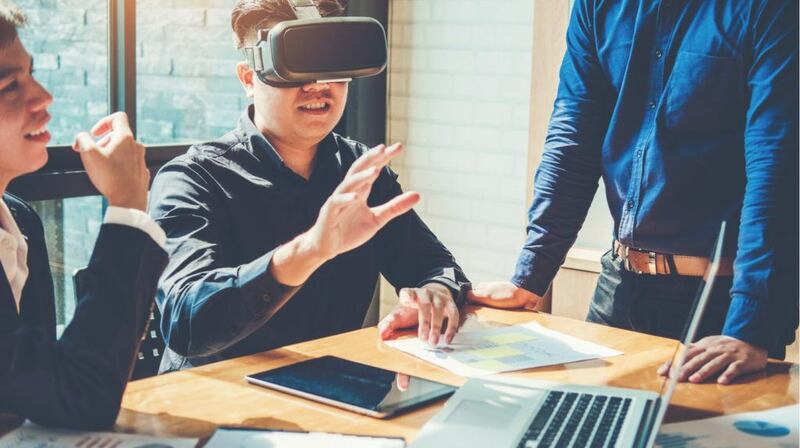 Rather than on-the-job practice, immersive learning takes real situations and allows the learner to control the outcome; connecting with realistic experiences in a safe environment. By allowing room for mistakes, you are able to practice making decisions and understand the effects before applying them to real life. As a learner, you are in control of how scenarios unfold. Not only does this motivate you but it increases engagement levels which improve knowledge retention. A lot of immersive learning can be tailored to organisational practices, values, and beliefs. Alongside other benefits, you can see why it is becoming the more feasible choice of learning. The course gives you the option of four different characters with different mental health issues and allows you to understand how your behaviour can affect anyone suffering. To do this, technology puts you into the shoes of your character to experience their day-to-day life. The task is to improve the quality of their day through different support mechanisms. At the end of the ‘day’, you are given a personalised reflection. Reflection enables you to view how positively or negatively you impacted your characters' lives, the option to compare your choices with others and alternative outcomes. With their unique approach, Elucidat supported the Open University to educate people on a sensitive topic. As technology evolves every day, this is such a powerful way to utilise it. Using a browser-based platform, Immersive Intelligence delivers cybersecurity training on emerging threats and zero-day vulnerabilities in a safe online environment. With up-to-date cyber security becoming more vital, Immersive Labs provide a feasible way to learn. Through story driven virtual games, ‘labs’ are created for learners with real-time threat intelligence. The real selling point is that they use real content to provide same day emerging threats to fully immerse the learner. The challenge: to find your own solution. By encouraging creative thinking, having to find your own solution reaps rewards of skill development and knowledge retention. The platform also allows you to keep track of progress, including strengths and weaknesses in your solution. The platform allows the whole team’s progress and capabilities to be benchmarked against industry frameworks, a great element to understand what needs to be done next. Working as an authoring and publishing tool, Uptale provides an interactive 360° experience for trainers, teachers, and learners. The use of 360VR enables higher engagement, retention, and attention through real-life situations. Putting the learning in your hands, Uptale’s platform allows you to create, share and track your own immersive experience. Although this may seem a complicated task for most, their platform makes it simple. You upload your 360° content, add in your interactions, and then you’re ready: you can share your learning experience with desired users. Wanting to reap the benefits of both online learning and gamification, Near-Life™ took the next step in immersive learning online by digitising role-play. Alongside these elements, Near-Life™ makes learning fully interactive to push engagement and retention levels. To provide a bespoke course, they work alongside clients to create scenarios unique to them. Using real actors and locations to reflect procedures, values, and environments, the platform creates realistic first-person experiences for learners. The challenge of learning is to make real-time decisions in each scenario. Intelligent reporting on the platform provides personalised progress and feedback on each decision made as well as overall organisation analytics. Both provide helpful insights into learners’ understanding and highlights any gaps in their learning. Near-Life™ has provided learning platforms for humanitarian workers, emergency services and corporate work. For sectors like these, it is inevitable that roleplay should be a key part of learning. Unsure about what to do in an emergency? Lifesaver can help you. If a bystander starts CPR whilst waiting for emergency services it doubles the chance of survival. Lifesaver provides the opportunity to learn life-changing skills through immersive scenario-based learning, for free! Through interactivity and live action films, Lifesaver teaches CPR using your computer, phone or tablet. Live films enforce the impact of teaching, showing you how emergency situations unfold in real life. The challenge is to be able to make critical decisions to save a life and, as your scenario progresses, you are able to see the impact; whether that be good or bad. A great element of using Lifesaver on your phone or tablet is that completing the action requires certain movements; for example, moving the device up and down to complete CPR. As well as taking you through scenarios, Lifesaver also gives the opportunity to hear from experts in the field. With the rate of survival in the UK needing to increase, Lifesaver is an easy and innovative way to teach such important skills, something we’d all benefit from. Why Choose Immersive Learning Online? One of the most effective ways to learn is through experience. Immersive learning online provides just that and allows learners to do so in a safe environment. From corporate work to healthcare, immersive learning online can be adapted to suit any learner and can prepare them for either life on-the-job, or situations they may encounter in day-to-day life. With integrated feedback tailored to the learner and the organisation, using immersive learning online is a fantastic way to engage learners today.